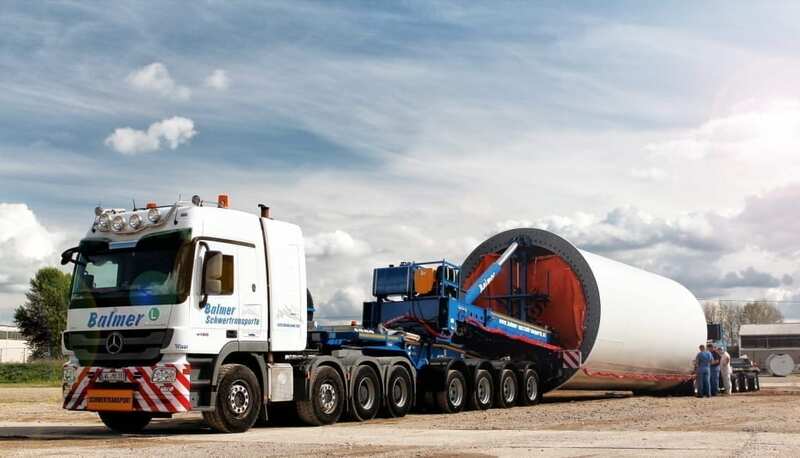 The Nooteboom MEGA WINDMILL TRANSPORTER is a unique and universal transport concept, specially designed for the transport of tower sections and nacelles of large windmill installations up to around 3 Megawatt. 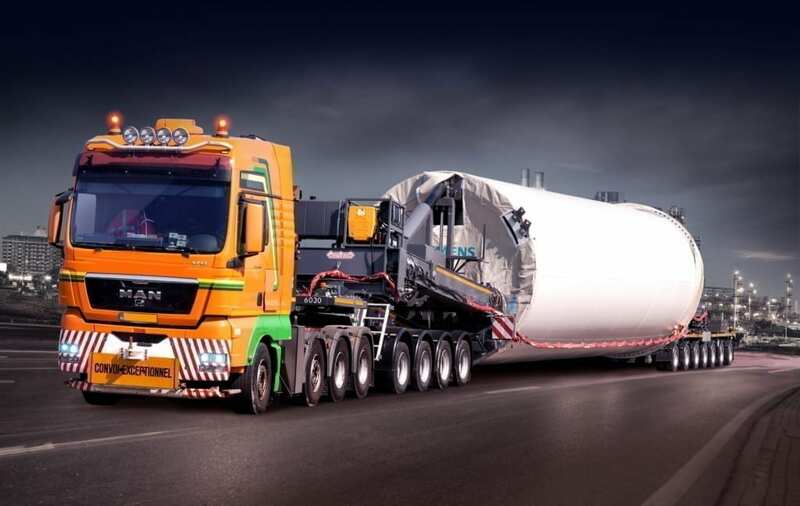 The MEGA WINDMILL TRANSPORTER adds a new dimension to windmill transportation because of the size, load capacity and manoeuvrability and, more importantly, the reduced operating costs. The MEGA WINDMILL TRANSPORTER is by now used around the world and regarded as the ultimate logistic concept for large tower sections and nacelles. The Nooteboom MEGA WINDMILL TRANSPORTER MEGA Windmill Transporter consists of two hydraulically extendible lift-adapters that can be employed on various vehicle types. During transport the load is clamped between the lift adaptors so that a load floor is not needed. At the front the lift-adapter is usually coupled via a turntable to a 3-axle or 4-axle Nooteboom Jeepdolly. The rear lift adapter is usually coupled via a turntable to a 7-axle hydraulically-steered Nooteboom NLD self-steering dolly. Due to the various pivot points all over the combination, the MEGA WINDMILL TRANSPORTER’s manoeuvrability is unequalled. It is possible to rotate the load in relation to the semi-trailers up to an 80-degree angle so that even very sharp bends can be negotiated with ease. Using the lift adapters, the load can be raised hydraulically up to around 1.5 metres above the ground surface so that the vehicle can easily be manoeuvred over a crash barrier, ditch or roundabout. Because there is no load floor the MEGA WINDMILL TRANSPORTER can also make optimal use of the maximum height clearance, making it possible to take the most efficient transport routes. This saves the transport operator an enormous amount of travel and waiting time and contributes towards further reductions in the operating costs. With the lift adapters tower sections and nacelles can be loaded/unloaded without using a crane. This makes for significant savings on crane costs. Coupling the load is extremely straightforward because the lift adapters can be moved in all directions by means of a single remote control. The clamp connections of the lift-adapters are hydraulically infinitely adjustable to fit the diameter of the tower section or nacelle from any manufacturer. The length of the lift adapters can also be adjusted so that they can be universally used worldwide on various vehicle types. The Nooteboom MEGA WINDMILL TRANSPORTER has a dead weight that is extremely low compared to alternative transport solutions. This is achieved by using simple and light vehicles together with the lightweight lift-adapters. The unique design of the lift adapters and use of high-strength steel ensure these vehicles have a very low dead weight of just 35 tonnes (whole combination 4+7 = 11 axles), while the lift capacity of a lift adapter set is 100 tonnes. The end result is an extremely high payload together with a combination length that is kept to a minimum. Of course the exact payload depends on the transport combination chosen and the country where the transport takes place.